One of the things that jumps out at you in the Spec Miata rulebook is the little allowance in the Suspension category that mentions “Fat Cat Motorsports SM Kit”. What is this and why do we need it? To those building their first SM, this is a VERY important piece of your suspension puzzle and should be considered as necessary as the shocks and springs themselves to your car! In the Spec Miata class of SCCA and NASA racing organizations, there are a very specific set of rules regarding what modifications you can and can’t do on your car, and also specified parts that you can (more or less, “have to”) use when building your car. The rules cover everything from engines, drivelines, suspensions, roll cages, weights, etc… 99% of EVERYTHING from the front bumper to the rear! There are of course things that are open, such as brake pads, seats, steering wheels, shift knobs, etc… Things that won’t necessarily make the difference or provide an advantage over another competitor. These strict rules are meant to create a “high-water mark” for people to build a car to, which leads to cars that are very equally matched when built to 100% of this mark. You of course don’t have to build your car to the high-water mark, but it is common knowledge that people who want to be competitive and go for a win will have a car built to this degree. You can’t expect to bring a knife to a gunfight and win, no matter how good you are at throwing a knife! For that 1% of the car that is not covered in the rules, it is stated as a blanket that “if it doesn’t say you CAN do it, you can’t do it.” This answers a lot of questions people have about certain things not covered in the rules specifically, and will extinguish some outlandish ideas as well. It generally works well as most racers want to observe the spirit of the rules and participate in equal competition to test their driving skills on an even playing field. Back around 2007 or 2008, there was a rules change that allowed 1990-1997 Miatas the use of the 1999-2005 Miata style shock mount. The reason for this change was that the 1999-2005 Miata was produced with an updated shock mount (often referred to as a “shock hat”) that was superior in design to the 1990-1997 style of shock mount. It provided ¾” extra shock travel by allowing the shock shaft to extend further upwards, which in turn allowed the car to have a lower ride height whilst maintaining proper shock travel. 1990-1997 cars essentially had to “slam” the ride height to access adequate camber settings easily achieved by the 99-05 chassis, as the 90-97 shock mounts in conjunction with the Mazdaspeed bump stop (which is what was included in the SM suspension kits) did not allow for the car to be lowered enough to get the proper camber settings. Translated to on-track results, the 1999-2005 cars have a clear advantage in both traction and tire wear due to the superior shock hats. Allowing the 90-97 cars to use the 99-05 shock hats was an equalization attempt that wasn’t needed for close to 10-years as there were very few NB chassis (99-05) cars racing in the class before 2006-2007 and no immediate need for equalization. It wasn’t until the 99-05 cars started showing up and dominating the competition that this issue was uncovered. NA style 90-97 Miata shock hat on left as compared to 99-05 NB Miata style on right. Notice the differences in spring location, translating into ride height changes. The 99-05 shock hat on the 90-97 chassis update worked, as it provided ¾” more shock travel to the 90-97 cars and helped them achieve the camber they needed – HOWEVER – there was an issue that was uncovered after a short while. The original Mazdaspeed Spec Miata bump stops (produced by AWR) were designed to work with the 90-97 style of shock mount and did not mate up correctly with the 99-05 shock mounts properly. The Mazdaspeed shock mount is rubber bump stop molded to an aluminum ring that served as both a bump stop and spring perch for the 2.5” Eibach race springs. The upper side of the spring perch sat flush with the shock mount on the 90-97 design, but on the 99-05 shock mounts, there was about a 3/8” – ½” gap between the top of the perch and the shock mount. This gap was because the area above the spring perch on the Mazdaspeed bump stop was too tall – as it was designed for the 90-97 shock mounts – so the gap allowed the bump stop to move around and pivot inside the 99-05 shock mount. The pivoting eventually caused the bump stops to separate and become loose, which made them unstable and potentially unsafe for a race car seeing extreme suspension loads. There needed to be a fix for this problem, as the need to equalize the shock mounts between 90-97 and 99-05 cars was necessary (and already set in the rules). Rules are rarely (if ever) rolled back, and oftentimes another “patch” will be instituted to correct a shortcoming or fault exposed by a previous rule change. This is common and unavoidable in some cases. The “patch” for the 99-05 shock hats came in the form of a parts allowance in the rules that allowed the Fat Cat Motorsports Miata Shock Mount kit to be used. I highlighted the important part of the rule below as the rest of it is very confusing (see my other blog post about bump stop rules interpretation)! "All cars may use the Fat Cat Motorsports bump stop kit (p/n FCM-MT-KIT-SM) or the unmodified Mazdaspeed bump stop (p/n 0000-04-5993AW) in conjunction with the 1999-up stock upper mount assembly consisting of the upper mount (p/n: NC10-28-340C), the upper mount bushing (p/n: NC10- 28-776) and the upper mount washer (p/n: NC10-28-774), and shock body spacer over the shock shaft (p/n 1234-56- 789-AW). All other OEM upper mounting hardware shall be discarded. Non-OEM equivalents may be used in place of the upper mount, upper mount bushing, and upper mount washer only. No other modifications are allowed." Fat Cat Motorsports is a small suspension company in California that created some wonderful innovations in bump stops for a variety of cars, but mostly focused on the Miata. In a nutshell, the Miata comes with some pretty junk bump stops from the factory, and Fat Cat Motorsports created kits to totally replace the lacking OEM parts and provide additional suspension performance at a low cost. What was to become the FCM-SM kit is not just bump stops, but rather a complete “conversion” kit that allows 1990-1997 Miata shocks to properly interface and be used with 1999-2005 Miata shock mounts, with far superior materials and hardware. If you didn’t already know, all Spec Miatas use 1990-1997 Bilstein HD shocks, even the 1999-2005 cars. The reasons why are beyond the scope of this article (shock shafts are too long on the 99-05 shocks and 90-97 shocks allow better shock travel when lowered. Perhaps I’ll write another article about this soon). Fat Cat’s “conversion kit” is appropriately called a “shock mount system”, as it replaces the bump stops and all of the pieces associated with the 99-05 shock mounts (two rubber bushings, two washers, and a nylock shock nut) with far superior MCU (micro-cellular urethane) bump stops and bushings, a 95A urethane upper spring perch that is designed for the 99-05 shock mount, as well as purpose-built custom hardware to hold it all together properly. Not only does it revolutionize the 99-05 shock mount system, but it completely solves the issue with the Mazdaspeed bump stops incompatibility with the 99-05 shock mounts. The kit was engineered with specific density 36mm bump stops that were proven to be the right formula for a Miata racecar. The upper and lower bushings are precision-cut from the same stock as the 36mm bushing, so they are the same material. The lower washer is red anodized aluminum of a specific thickness. The keystone to the kit is the proprietary 10mm shoulder nut that squeezes the entire assembly together. The issue with bolting 99-05 shock mounts to 90-97 shocks is due to the length of the 90-97 shock threads at the top of the shaft not being long enough to protrude through to the top of the shock hat, so a common nut would not be able to be threaded on. The special shoulder nut in the FCM kit plunges down into the shock mount and through the bushings to engage with the shock shaft threads. Without this shoulder nut, there would be no easy and safe way to fasten the 99-05 hats to the 90-97 shocks. Also - and the key to the SM issue - is that the Fat Cat shock mount kit was the perfect solution to equalize the 90-97 chassis with the 99-05 chassis, as all cars could now use the exact same suspension setup. This kit worked very well and was a “must have” among the Spec Miata racers looking towards the front of the pack. Fast forward several years down the road and we ended up with the appearances of replica Fat Cat kits. We understand why this need arose, as we once attempted to create our own Fat Cat kit as well in the distant past. The reason for this was because for a time, the Fat Cat SM kits were almost impossible to get from Mazdaspeed Motorsports Development, the sole supplier of them outside of Fat Cat directly. When you’re building a race car, you need the parts or else your entire build will be delayed, forcing you to go with another brand, or worse off in the case of Spec Miata where the rules dictate specific parts, telling your customer (or yourself) that the car will not be ready for them until the parts become available. This is not a good situation to be in, and is one that can cripple a build or race deadline. 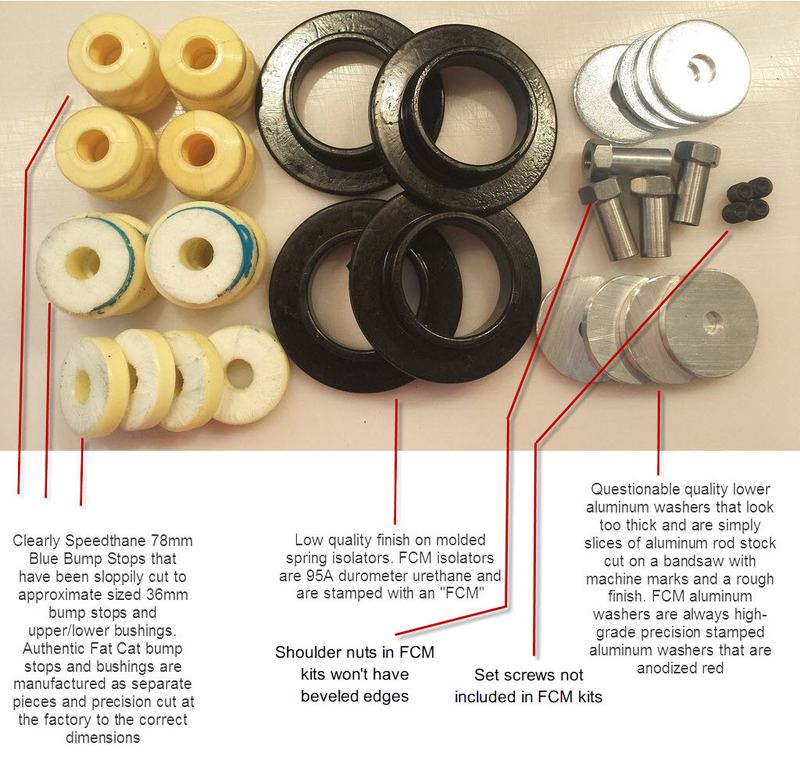 For a shop or tuner that has the resources and know-how, it is common-sense that they will try to recreate or reproduce a part or kit if they are in a dead-end situation, such as it was with Fat Cat kits a few years ago. The kit was not readily available. Being a shop that sold the kit directly from Fat Cat, it was impossible to get an order filled by them. We had stock orders that went unfulfilled for months on end, which forced us to tell our customers that we couldn’t deliver. This eventually caused us to pull the product from our catalog to avoid the customer service issues that accompanied lengthy backorders. The kit was expensive. At first glance, the Fat Cat SM kit seems expensive for what it is (more on this below). Surely like many other SM shops, we set off researching how these kits were made and if we could find off-the-shelf components to create our own kit to offer our customers in place of the FCM kit due to the availability issues and cost. We came up absolutely blank on this quest. It turns out that there are no off-the-shelf components used in the FCM kit, it’s 100% proprietary. We quickly gave up on our vision of creating our own shock mount kit as it would have required a lot of time, money, and effort to reproduce it, which we didn’t have. Luckily there was a light at the end of the tunnel! Shortly after failing to create our own FCM kit, we were approached by Fat Cat Motorsports and offered to take over production and distribution of not only the coveted SM kit, but ALL of their shock mount and bump stop kits! This was a welcome invitation, as we really wanted to offer this kit to our SM customers, but being the sole supplier to be able to open up distribution to ALL of the shops who wanted to sell the FCM kits was icing on the cake! Our main objective was to make certain shops and customers who needed the FCM kits had quick access to them without backorder, so we heavily stocked up on all of the components of the kits and opened the doors to dealers to have a way to obtain these kits and offer them to their customers. Revisiting the “too expensive” notation from above, we quickly realized why these kits cost what they do. Like I said earlier, 100% of the kits components are proprietary, which means you cannot just buy them off-the-shelf and are by no means DIY. With this, it means there was extensive engineering and CAD design needed to create the parts, testing, sourcing a facility that could reproduce your completely custom parts with the highest of quality and tolerance levels (in the United States), and the investment into keeping very large numbers of about a half-dozen different parts in inventory. This takes a great effort and shouldn’t be overlooked when considering the price of the kit, which we certainly understood after we assumed Fat Cat distribution and manufacturing! As quick as we restored the availability of the FCM SM kits, there was already damage done by way of replica kits being on the market for quite some time. A lot of SM racers and prep-shops were forced to use these replica kits to complete projects and get their customers on track despite the fact that they were not the correct specified kit in the rules. The general thought to this was “well, we couldn’t get the real Fat Cat kit, and aren’t going to wait around until they become available, so it is what it is. I need my car out on track.” Luckily, availability is not an issue now and hasn’t been for the last 2+ years, but a replica kit still remains on the market. While we understand there was a need to recreate this kit in years past, there is certainly no need to continue to do so now. Not only is it blatantly going against the Spec Miata rulebook (it clearly states that all cars must use Fat Cat Motorsports Spec Miata kit FCM-MT-KIT-SMW), we make these kits readily available to all SM prep shops at generous wholesale pricing to ensure that there is no need to force anyone into thinking they can make it cheaper (or easier). In the end, it’s just not worth it to both the shops making the replica kits, and for the people using them. When push comes to shove – as it often does in Spec Miata – using a replica Fat Cat kit is an easily protested part in post-race tech inspection. If you can’t see the differences from our examples above, then you’re not looking! While we know we cannot stop the replica kits from being on the market, we certainly hope that everyone who uses them understands the ramifications of using one and what could happen if protested. It might mean the difference between being stripped of a national championship and saving $75. Easy choice in our book. Hurricane Irma, and THANK YOU! Product Release: 5X Racing Miata Door Bushings! The Official 5X Racing Blog!